This is one of our favourite houses. It embraces our ideals of building small and efficient. It is also one of our earlier prototype projects to test out ideas on future proofing. 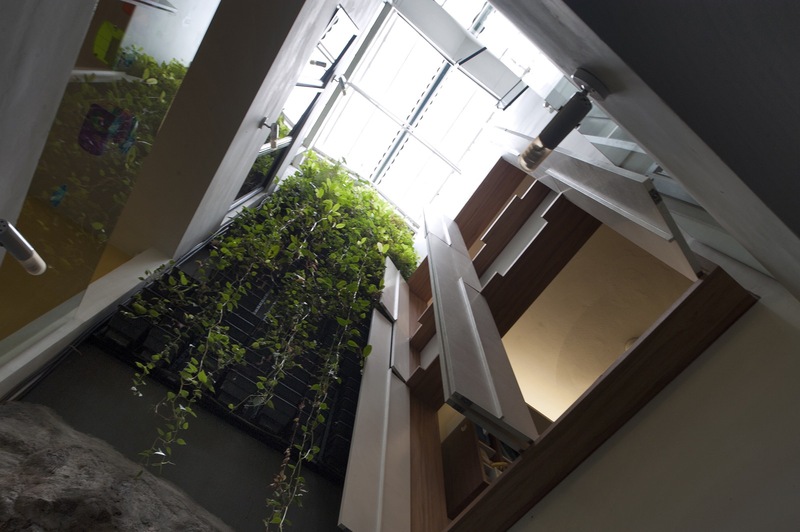 It was originally a compact two and a half storey, 1625sqft intermediate link house, which we souped-up to 4 storeys (half basement and master bedroom attic) with an internal greenwall courtyard. It now has an approximate 2,400 sqft final built up. When we started, the clients; a young couple with their first child on the way, had a very tight budget (as always!). This was their first landed property (they were then staying in an apartment) and it was going to be “the” house; their (hopefully!) final home, where they will settle down properly and raise a family. In order to build the house within budget, the footprint had to be kept small. We are a very big proponent of efficient design and we believe we can fit in all the clients needs, without having to extend the house too much. The other effective way would be to future proof the house. That is, to design the house to its maximum potential, meeting the client's full wish list but...we prioritise and only build what is immediately required to them. We get all the messy and complicated infrastructure components built first, and the other dry works like cabinetry and joinery (even additional bathrooms and bedroom walls), can be added later when it is needed. The clients can add these on 10 or 15 years down the line. For example, when they initially moved in with their newborn baby, the house had a masterbedroom, a study, maid's room, a large open area which doubled up as a guest room and playroom, and a total of 3 bathrooms. In the future, within the same footprint, the house can effectively be built up to have 4 more rooms (in addition to the masterbedroom, study room and maid's room) and an additonal bathroom. We designed and built the infrastructure for this! The other key feature of this house is the central courtyard / light well which punches through all the way to the top. This is the main source of light and air for the house. There is a jacked pitched polycarbornate roof at the top which allows cross ventilation and keeps the rain out. The height (4 storeys) of this airwell makes for an excellent stack effect that keeps the house breezy and cool. This central courtyard allows users to have line of sight from practically every space to another. It is the visual link to all the spaces in the house. This is the key factor in designing small spaces: continuous line of sight (and a lot of natural light!) 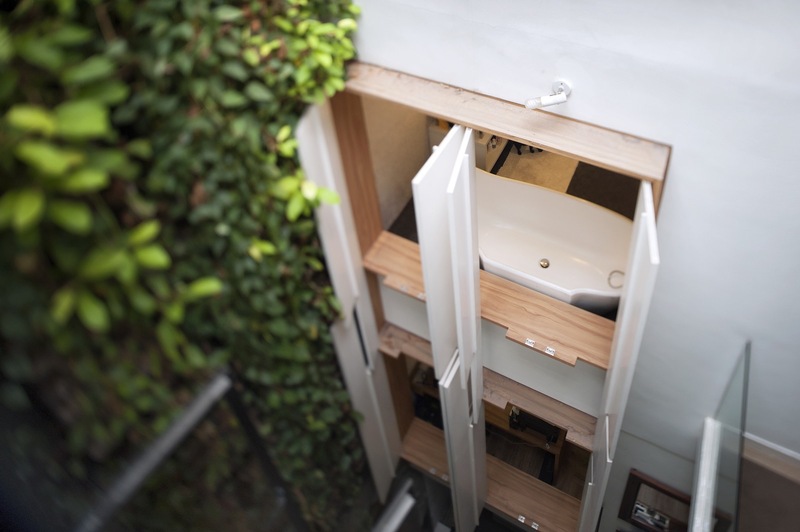 ensures that the spaces do not feel claustrophobic and gives the perception that the spaces are much larger than they actually are. We also included the piping infrastructure for rainwater harvesting where the harvested rainwater can be stored and used for watering the plants, washing the cars and even flushing the WCs in the bathrooms. We didn't put in the storage tanks, pumps and filters due to the limited budget but they can be added in later. Rainwater from the roof and garden terrace are carried down to the predesignated area for the storage tanks via siphonic rainwater downpipes by Fast Flow. In the existing house, the ground floor was just the carporch and had a small landing for the staircase leading up to the first floor. We excavated the ground and extended the area back, creating an additional space which could be used as a future office/ guestroom/ AV room. In this new space we also prepared the plumbing for a future bathroom, and covered the pipes over with vinyl flooring, leaving it as one big open space. A few years after moving in, the client (the husband) converted this area into his personal gym and private den! We created an extended rc slab for the carporch which doubles up as the garden terrace for the floor above. This gives a large covered space for the ground floor. Potentially, this covered area could also be used as another room (and still leave enough space for 2 parked cars!) should the need arise in the future. This is the floor where the house actually begins! 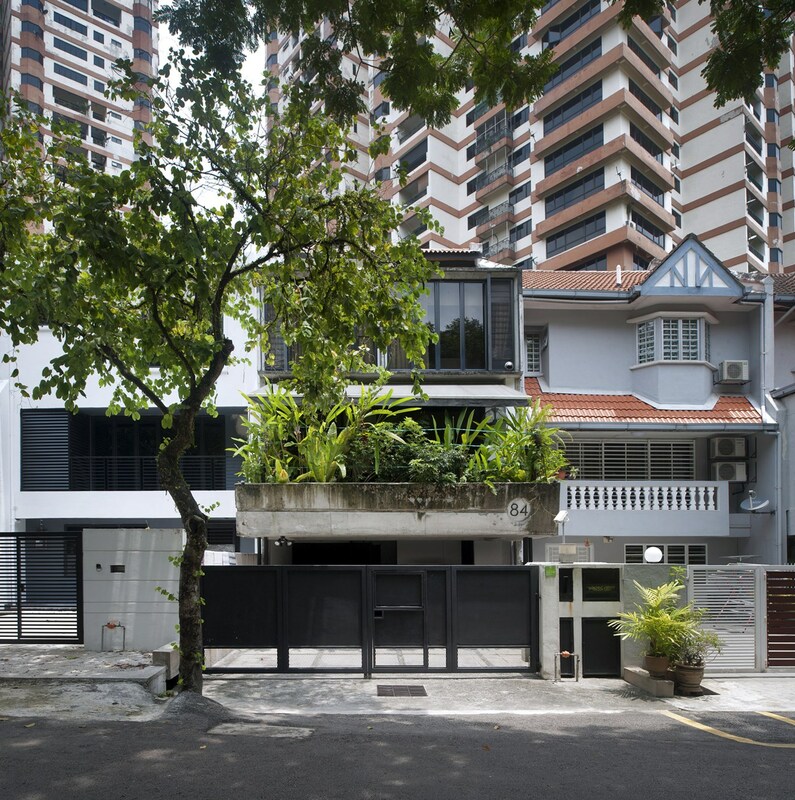 The existing stairs and new courtyard divides the house into two portions. The front portion becomes a combined living, dining and kitchen area which opens out to the garden terrace (the new carporch roof!) and this looks out into the foliage of the park beyond. The kitchen counter top doubles up as the dining table in this compact kitchen. In the rear portion, the study room opens up into the light well with pivot fins that stretch up to the second floor. The study looks across to the living and garden terrace beyond at the front and has window slits that open up to the narrow backyard behind. The maid's room, bathroom and utility zone are here as well. 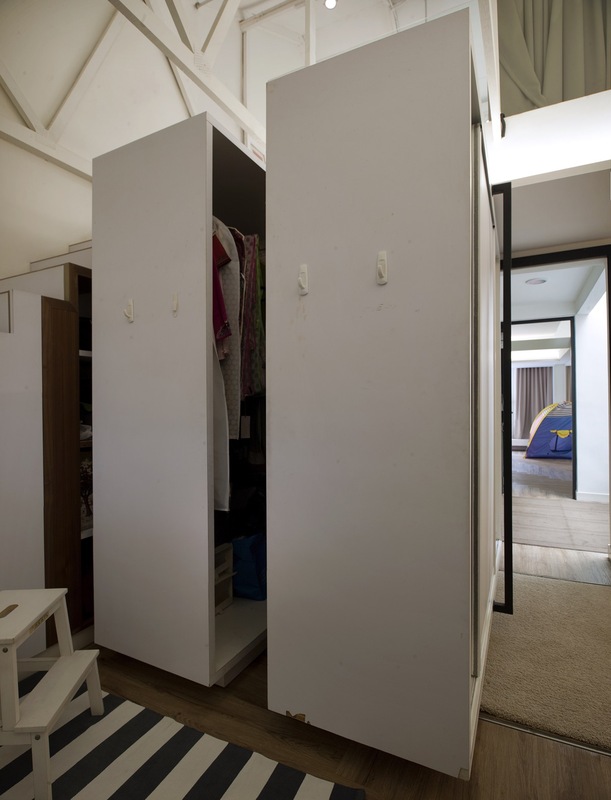 At the back of the house is a narrow backyard strip which is fully caged and secured from the back lane with an expanded metal cage and this is where the clothes are hung to dry. The idea is that since this floor is where the family spends most of their time, here needs to be full line of sight to every single corner on this floor – ideal to keep an eye on little kids. 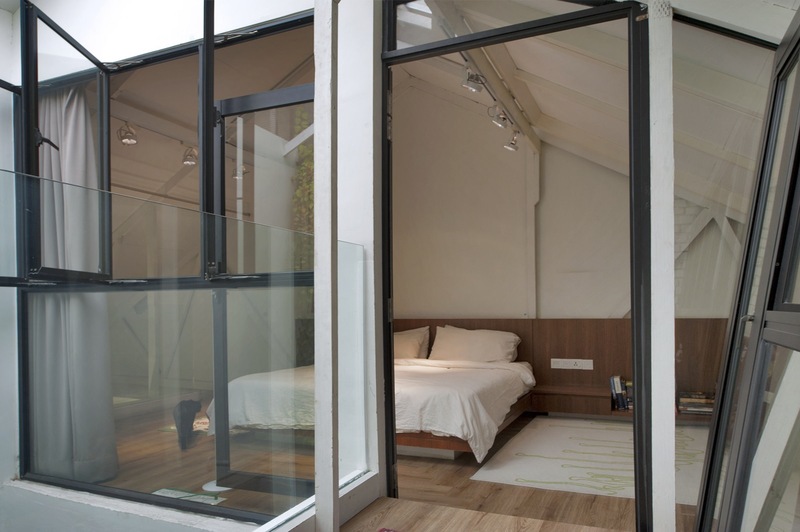 The front portion is an open space which can be divided with sliding doors into two separate rooms. We built the sliding tracks but omitted the actual sliding door panels for future installation. There is a bathroom in this space that is to be shared by these two future rooms. 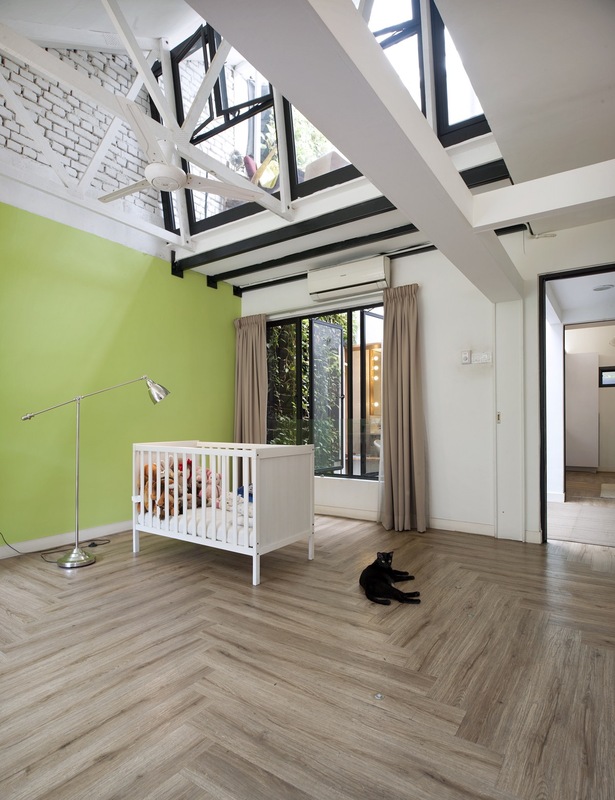 For now, the client prefers it left as one big open space as a playroom which the parents can look down into from the masterbedroom above! This playroom space has a fantastic view of the park in front of the house. In order to ensure constant cross ventilation throughout the house, we made sure every band of windows had at least one set of adjustable glass louvres which could be left partially open and still keep the rain out. All windows also have mosquito nets and grills on them. The grills are there for security and because Gasing Heights is well known for thieving monkeys! After the clients moved in, there was one incident where a pair of baby monkeys managed to find their way into the house, all the way down to the kitchen! After laboriously checking, we discovered a 100mm gap below the jacked roof right above the courtyard. This is where they managed to slip in! This gap was eventually sealed with an ex-met grill. The rear portion of the second floor is actually the beginning of the masterbedroom suite. One walks into an open masterbathroom with a bathtub looking over an amazing view of the green wall and the light well. The masterwardobe is also on this floor. Due to space constraint, we came out with the idea of building the wardobe cabinets like sliding/stacking storage compactors! There is a staircase here that leads up to the attic/loft above. Even the steps of these stairs are storage drawers! The top floor is the actual roof space of the existing house. We strengthened and repositioned some of the existing timber roof trusses and added a floor slab to create a space for the masterbedroom proper. There is a bridge that extends out from the masterbedroom over the playroom below, to create a reading nook which also looks down into the light well. The house is still not complete as the clients are still adding on to it as their needs change and family grows, but that's our entire basis for future proofing! Houses are not static- they're to last for years and generations and thus need to be able to easily adapt to the changing needs of its users. CLICK HERE to check out more pictures of this project.